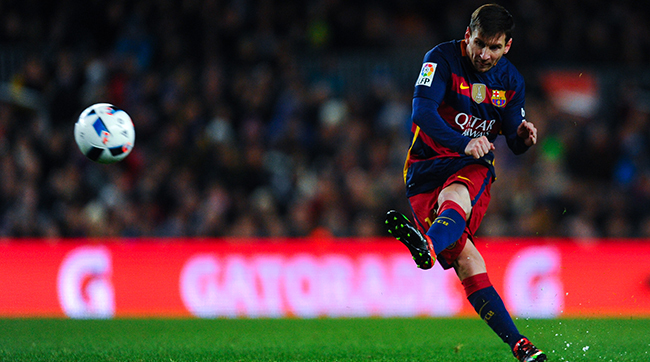 ​ZURICH (AP)— Now score it Lionel Messi 5, Cristiano Ronaldo 3. Messi won the Ballon d'Or trophy on Monday as the world's best player in 2015, ending Cristiano Ronaldo's two-year hold on soccer's top individual honor. "It's incredible that it's my fifth," said the 28-year-old Barcelona and Argentina forward, who won four straight FIFA awards from 2009-12. Messi earned his record-extending fifth after being runner-up to his great rival for the past two years. "It's a very special moment for me to be back here on the stage," Messi said in Spanish in his acceptance speech, "after being there in the audience watching Cristiano win." Five major titles for Barcelona last year - leaving none for Ronaldo's Real Madrid - brought the golden ball back into Messi's hands. It was not even close. Messi got 41.33 percent of total voting points in a 23-candidate ballot. Ronaldo received 27.76 percent and third-place Neymar, Messi's Barcelona teammate from Brazil, got 7.86 percent. Voting was by national team captains and coaches, plus invited journalists, from FIFA member countries. As usual, Argentina captain Messi and Portugal captain Ronaldo ignored each other on their own ballot papers. Messi voted for three Barcelona teammates and Ronaldo listed three Madrid colleagues. However, Portugal coach Fernando Santos did put Messi second to Ronaldo. 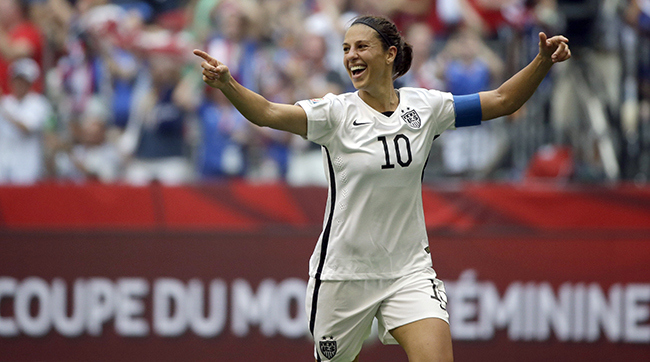 It was a stellar night for Barcelona and the World Cup-winning United States women's team. Luis Enrique was named best coach after guiding Barcelona to win the Champions League, Spain's La Liga and cup, UEFA Super Cup and Club World Cup. 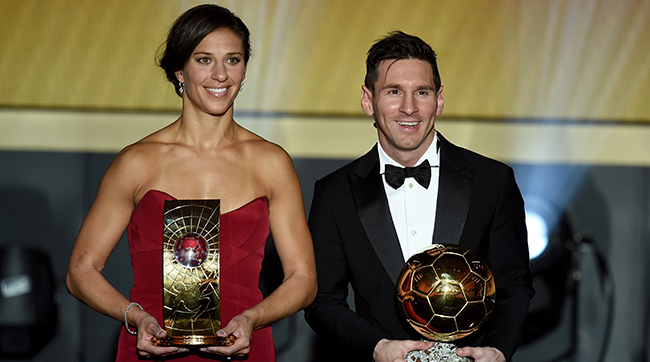 The women's awards were won by U.S. captain Carli Lloyd and coach Jill Ellis. Lloyd stood out by scoring six World Cup goals, including a stunning hat trick in the opening 16 minutes of a 5-2 rout of Japan in the final. At first unable to speak with emotion, Lloyd was loudly applauded as she prepared to begin her acceptance speech. "I honestly wouldn't be sitting up here, standing up here, without my incredible teammates," said Lloyd, who made the three-player shortlist for the first time at age 33. Lloyd got 35.28% of the voting points, ahead of Germany's Celia Sasic with 12.6 percent. Third-place Aya Miyama of Japan got 9.88 percent. Sasic also scored six goals in Canada to win the tournament Golden Boot, then retired aged just 27. Ellis won the coaching award in women's football ahead of two men: Japan coach Norio Sasaki and Mark Sampson, who led England to third place at the World Cup. English-born Ellis got the most dominating win. She scored 42.98 percent, ahead of Sasaki on 17.79 percent and Sampson's 10.68 percent. The Americans last swept the women's awards after its 2012 Olympic title, when forward Abby Wambach and Swedish coach Pia Sundhage were rewarded. Barcelona also swept the 2011 men's awards when Messi and then-coach Pep Guardiola won following the club's previous Champions League title. Guardiola, now coaching Bayern Munich, placed second to his former teammate Monday, getting 22.97 percent against for 31.08 percent for Luis Enrique. Neither could attend due to team commitments. Chile coach Jorge Sampaoli placed third, on 9.47 percent, for guiding the host to a first Copa America title. Messi lost out in the Puskas Award for most beautiful goal to Wendell Lira of Brazil. Lira's bicycle kick for Goianesia against Atletico-GO in a league game topped an online poll that logged more than 1.6 million votes. FIFA dedicated its Fair Play Award to "clubs and associations helping refugees."